Lottie loves to be in the garden enjoying the flowers and the hum of bees buzzing. 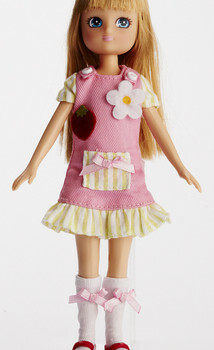 She comes dressed in a spring-like pink dress edged with fresh green cotton, removable strawberry and flower patches, knee socks and red Mary Jane shoes. Lottie is 7 tall. Measures 6.37 x 2.37 x 10.5 in box. WARNING: CHOKING HAZARDSmall parts. Not for children under 3 yrs. Lottie™ is a new, innovative fashion doll for girls aged 3- 9. Since her debut, Lottie has won 12 awards in the USA and UK, generated international press coverage and been the beneficiary of positive parent blogger reviews and international press coverage. 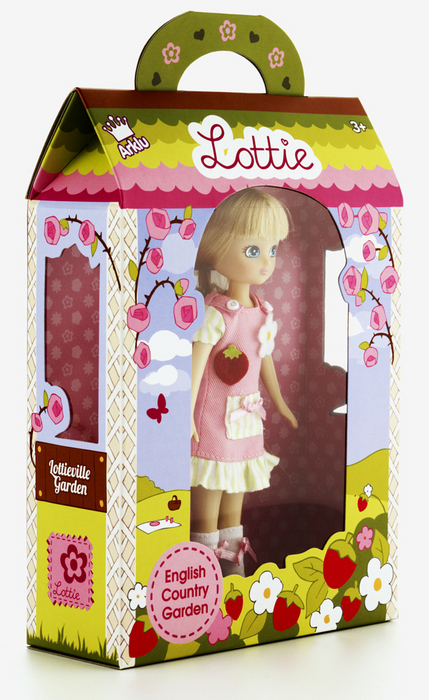 Lottie is fun and educational; an affordable, inspirational ‘pro girl’ doll.